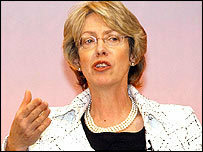 Health Secretary Patricia Hewitt was heckled today at Workers' Union Unison's Health Conference. Hewitt revealed at the conference that reforms were needed to save the NHS, including more job cuts, and a reduction in the number of hospital beds. Hewitt repeated the claim she made over the weekend that the NHS has had its "best yeard to date". As a result of this claim, the NHS staff booed and heckled her, interrupting her speech frequently. The Conservatives have called for Ms Hewitt to come to the Commons to make a statement on job cuts in the service. The crisis in the NHS is now so bad, they say, that Gordon Brown chose not to even mention it in this year's budget. David Cameron has been on about the environment again in the run up to the local elections. He has been defending his eco-friendly car (after Ming Campbell got rid of his beloved Jag for the same reason), and he has been harping on about his visit to a Norweigan glacier last week. In addition, Cameron wants the emissions from all cars to reduce to a level of 100 g/km in 2022, and by 2030 he will call for that figure to be an average for all cars on Britain's roads, not just newer models. But will green Dave appeal to the voters on May 4th? The polls say no, but we will have to wait and see.